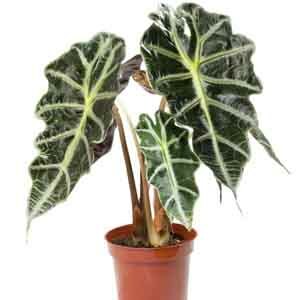 Alocasia are popular for the drama and tropical style their foliage brings to any setting and are often called Elephant Ears. 'Polly' is a striking variety with leaves of deep, glossy green and contrasting white ribs. It makes a perfect companion to plants with lighter colored or more finely textured foliage. Easy to grow indoors or outdoors in pots or beds. Keep soil evenly moist and fertilize regularly.